How are Wee Forest Folk made? Wee Forest Folk is a small family business, which delights in producing a line of miniatures - most of which are mice. Wee Forest Folk sculptures are created, produced and copyrighted by the Petersen family since 1972 and are handcrafted entirely in Carlisle, Massachusetts, USA. Each miniature sculpture is a casting of an original piece hand-sculpted in clay. Meticulous hand painting brings each sculpture to life as talented artists have been carefully selected for their delicate hand skills. You can view the full story about how they are created on the Wee Forest Folk website. 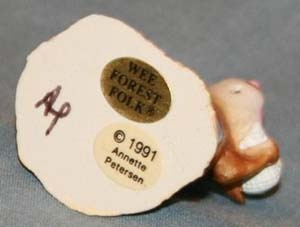 Where can I find a complete list of all of the Wee Forest Folk retired pieces? A list of all of the retired regular edition pieces is maintained on the Wee Forest Folk website. Also, the Wee Forest Folk Collectors Club Master List is a great on-line reference, listing retirement dates, estimated values, color and style variations. Most of the listings have images, too. Where can I view the Wee Forest Folk Catalogs online? My Wee Forest Folk piece is broken. How can I get it repaired? He will respond with an estimate and will begin the repair process after receiving your okay. Please be patient as he works full time at the factory and does the repairs outside of work hours. You will be very pleased with his professional work! How do I know what year my piece was sculpted, or who sculpted it? On the bottom of each Wee Forest Folk piece, you'll find a gold sticker that says "Wee Forest Folk". You'll also see a separate sticker which says it's copyright date and the name of the sculptor (Annette Petersen, Bonnie Petersen, Donna Petersen, or William Petersen). You'll also find the initials of the scupltor signed on the bottom of each piece (AP, BP, DP, or WP). This is how you know you have an authentic handmade Wee Forest Folk piece. I have some older Wee Forest Folk pieces. What are they worth? A collectible item's value varies depending on supply and demand. Just because a piece is older does not necessarily mean it is worth more than what it's original selling price. And the actual price one can get for selling a Wee Forest Folk can vary from day to day due to current market conditions, kind of like the stock market. Most pieces have been released in several color schemes, with some colors being limited editions. Generally, if an item was a limited edition or is in a color scheme that was produced in smaller quantities (ex. 500 or less) you can generally assume that it's value is worth more than the regular release edition. Also, it's present condition can vary the resale value greatly. Have the colors faded or chipped, has it been protected from the elements or stored in a smoke-free, dust-free, and pet-free environment? Most people will start their search at eBay. You can search through their completed listings to see if your item has sold recently, and see for how much. You can also search for current offerings on ebay, craigslist, etc. Or visit the forums at the Wee Forest Folk Collector's Club, or the collector's shows like Mouse Expo and Folktoberfest. To get an accurate up-to-date assessment of an item's value, you will need to have it appraised. You can locate a specialist near you with this online directory. Look up advice about the appraisals process, view an excellent beginner's guide to collecting at Antiques Research Guide, or find more information about appraisers at the American Society of Appraisers or the International Society of Appraisers. For a guide on using the internet to research antiques and collectibles, check out What’s this worth?.Here are a few fee-based appraisal services available online: WorthPoint Offering market data on collectibles, including prices, descriptions, pictures and sale dates, compiled from hundreds of auction houses. Value My Stuff Evaluations of collectible items (from uploaded images) within 48 hours. This service is based in England. Old and Sold A fee-based appraisal service. Responses within 48 hours to requests submitted via online form and uploaded images. I'm looking to sell my collection. Do you buy older Wee Forest Folk pieces? No. We're not in the business of selling after-market Wee Forest Folk pieces. We only purchase items wholesale direct from the manufacturer and sell them for the manufacturer's suggested retail price. We do not mark-up pieces over that price. If we chose to purchase any older Wee Forest Folk pieces, we would only sell them as "used" pieces. As such, we would only be able to purchase them for far less than their original selling price, and only after inspecting them to ensure they're in re-sellable condition. You will generally get a much greater return for your pieces if you sold them on ebay, craigslist, or directly to other collectors. Some collectors might even offer to "trade" other pieces of similar value that you might be missing in your collection, for your piece that is missing in their collection. The Wee Forest Folk Collectors Club For Sale board is another popular place to post WFF for sale. You may post Want Ads there, too!